About the only time I get to eat sweet potatoes (or more commonly known in the vernacular as kamote or camote) is when we dine at Max's, where the chicken comes with fries from this stuff. The camote and I have a long history of goodness. When we were younger, my resourceful Nanay sold camote Q (and banana Q... I love the letter Q here) to make ends meet; it would also be our merienda when we visit the store after school; in college we bought camote Q for our afternoon snack when we were working students at SLU; it is a hearty merienda item especially on rainy days. And not only is it affordable, it has health benefits as well! Sweet potato contain unique root storage proteins that have been observed to have significant antioxidant capacities. In one study, these proteins had about one-third the antioxidant activity of glutathione-one of the body's most impressive internally produced antioxidants. Although future studies are needed in this area, count on these root proteins to help explain sweet potatoes' healing properties. Our food ranking system also showed sweet potato to be a strong performer in terms of traditional nutrients. This root vegetable qualified as an excellent source of vitamin A (in the form of beta-carotene), a very good source of vitamin C and manganese, and a good source of copper, dietary fiber, vitamin B6, potassium and iron. How do these sweet potato nutrients support our health? If you or someone you love is a smoker, or if you are frequently exposed to secondhand smoke, then making vitamin A-rich foods, such as sweet potatoes, part of your healthy way of eating, may save your life, suggests research conducted at Kansas State University. 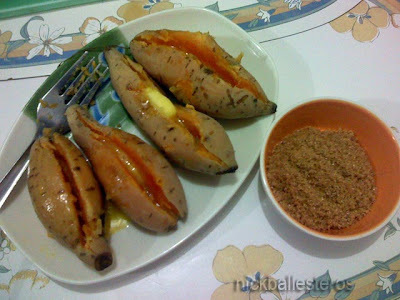 The camote is so easy to prepare. Peel off the skin (some people prefer it with the skin though, and that's all right), wash it up, chop into bite-size pieces, then fry over medium heat til the edges turn brown. I like it chopped into cubes and then drizzled with white sugar before serving. For camote Q, you need lots of cooking oil. 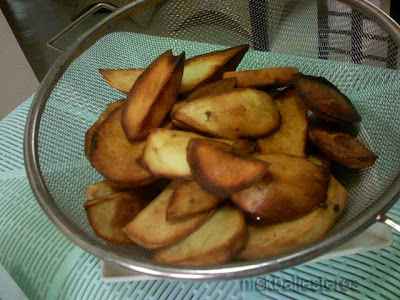 Pour a generous amount of brown sugar into the oil where it will melt, and then slide in the circular, chopped camote and the melted suger will stick to the camote while cooking. 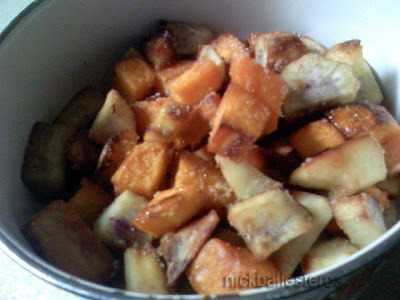 Another way to enjoy camote is to boil it! In a pot, place the cleaned-up camote and pour water to near-submersion point. Bring to a boil. In about 7 minutes, try pricking one with a fork. If you are able to pierce through with a bit of resistance, then it's done. You don't want a mushy camote. Drain the water, arrange on a plate, slice across, then insert butter. Serve with sugar on the side. I'm lucky that it is bountiful in Baguio City. 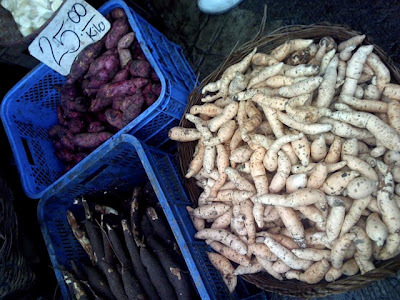 There are many camote varieties based on color. I like the ones with white flesh best, though you seldom see that around. There are yellows and oranges too. The purple variety is used by some ube vendors as extenders (at least, that's what I hear). And did you notice? I love sugar with my camote :-). You know what else you can camote? Steam the leaves and pair with bagoong (fish sauce) for a yummy side dish!